The Co-op is pleased to present GroupBuy savings for the Ultimate Science Curriculum Series, a Cathy Duffy 102 Top Pick from Supercharged Science. By joining this GroupBuy offer, you can save up to 50%! 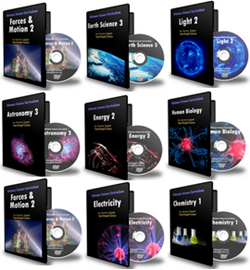 Ultimate Science Curriculum Series is a complete, self-guided, video-based DVD science curriculum that explains science topics to kids in a practical real-world way. It uses step-by-step videos to guide them through every detail of activities, experiments and projects that let them apply the concepts they just learned. And, even though this curriculum is video-based, it's primarily based on hands-on science. This means that your kids will be spending most of their time creating experiments and building projects -- not just looking at a computer. 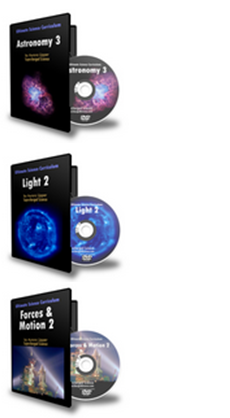 Step-by step video tutorials by an experienced science teacher. Many of us need help when it comes to teaching science, especially in the higher grades, so our science curriculum needs to be a self-paced, self-contained, comprehensive, resource-rich, and backed up with access to an experienced science teacher. That, in a nutshell, is what Ultimate Science Curriculum aims to be -- everything you need (except supplies) to give your child a complete homeschool science education. 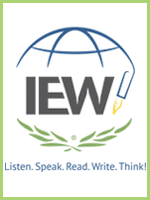 Visit the Ultimate Science Curriculum website. Fulfillment: Your product(s) will ship directly to you from the Supercharged Science warehouse within 3-5 business days from the day you place your order with us. Please allow an additional 5-7 business days to receive the products. Shipping: Your order will ship by FedEx Ground. Orders under $60 ship for $7.95 to U.S. Members. Orders $60+ will be charged 8% of the order total. International orders will be charged a $12 surcharge. Sorry - expedited shipping is not available. Returns/Cancellations: 30-Day Money-Back Guarantee: Simply let us know within 30 days from your order date if this isn't the right curriculum for you, and we'll refund you the purchase price (less shipping charges). Submit your cancellation request at our Contact Us page. You will receive return instructions via email and/or phone. Chemistry 1: Uncover the fundamental ideas behind chemistry with this introductory chemistry course. Students will discover how to create the four states of matter, grow crystal farms, experiment with phase shifts, crosslink polymers, shake up rainbow solutions, and stew up a chemical matrix of heat and ice reactions. Includes student worksheets, 24 instructional videos, 20 lessons, 64 page workbook, tests and quizzes... all in one complete package for grades K-3. Earth Science 1: An introductory course in getting to know our planet better through the eyes of a scientist. Students get to build a homemade weather station, complete with cloud tracker and hair hygrometer for measuring the Earth's atmosphere. Students also learn about convention currents, liquid crystals, air pressure, and how sunlight, water, and wind can be used as sources of energy. Includes student worksheets, 34 instructional videos, 32 lessons, 108 page student workbook, 176 page parent/teacher guidebook, tests and quizzes... all in one complete package for grades K-3. Life Science 1: Biology & Microscopes: Discover the science behind invisible life like plant structure, cell division, and genetics. Students will construct a water cycle terraqua column ecosystem, extract DNA, grow a carnivorous greenhouse, track traits, learn how to use a compound microscope, and more. Includes student worksheets, 32 instructional videos, 24 lessons, 117 page workbook, 171 page parent/teacher guidebook, tests and quizzes... all in one complete package for grades 1-6. All courses were assembled based on the national standards for science, and also from a decade of personal experience in teaching kids science. 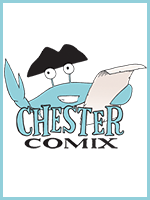 Each volume comes with student worksheets, instructional videos, lessons, workbook, parent/teacher guidebook, and tests and quizzes. 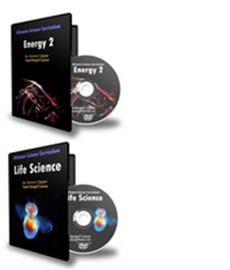 The Ultimate Science Curriculum DVDs contain the curriculum organized into a PDF document that are also located on the DVD. You may print out the worksheets for each experiment as you go along. The DVDs also contain instructional step-by-step videos that show exactly how to perform the experiments in the included workbooks. Forces & Motion 1: Dive into the study of force, friction, gravity, velocity, acceleration, and Newton's three laws of motion! Students get to build bridges that holds over 400 times their own weight, construct a rocket ball launcher, detect the magnetic field, learn about frequency and wavelength as they build buzzing hornets, sling harmonicas and air horns, and zoom balloon racecars. Includes student worksheets, 24 instructional videos, 22 lessons, 82 page student workbook, 119 page parent/teacher guidebook, tests and quizzes... all in one complete package for grades 1-4. Energy 1: Students build several different kinds of batteries, learn how solar, wind, and water can be used to generate electricity, construct simple machines, race bobsleds, zoom roller coasters, fire off catapults, build hydraulic-pneumatic machines, blast air horns, and so much more. Includes student worksheets, 30 instructional videos, 26 lessons, 87 page student workbook, 139 page parent/teacher guidebook, tests and quizzes... all in one complete package for grades 1-4. Astronomy 1: Discover the big ideas behind Newton's ground-breaking work. Students will learn about magnetic storms, listen to the song of the sun, learn how to chart the stars, and build a simple handheld telescope. Includes student worksheets, 17 instructional videos, 12 lessons, 68 page student workbook, 92 page parent/teacher guidebook, tests and quizzes... all in one complete package for grades K-3. Light 1 Students investigate the electromagnetic spectrum by using lenses, mirrors and more as they build several projects including an eye-balloon, pinhole camera, optical kaleidoscope as well as experiments in splitting shadows into a rainbow, going on a black light treasure hunt, getting colors from black and white, investigating chemiluminescence by mixing cold light, and making a beaker totally disappear. Includes student worksheets, 23 instructional videos, 18 lessons, 67 page student workbook, 110 page parent/teacher guidebook, tests and quizzes... all in one complete package for grades K-4. Electricity: Unlock the big ideas behind Faraday and Maxwell's ground-breaking work! Students will discover how to design and test circuits, detect electric charge, learn about electrochemistry as they construct batteries, play with the static electric field, and uncover the mysterious forces that redefined the entire field of chemistry and physics when they were first discovered. Includes student worksheets, 37 instructional videos, 26 lessons, 110 page student workbook, 213 page parent/teacher guidebook, tests and quizzes... all in one complete package for grades 2-8. Magnetism : Discover the big ideas behind Maxwell's Principles. Students discover how to detect magnetic poles and magnetic fields, learn about electromagnetism as they construct motors, generators, doorbells and earphones, and uncover the mysterious link between electricity and magnetism that marks one of the biggest discoveries of all science…ever. Includes student worksheets, 34 instructional videos, 23 lessons, 94 page student workbook, 186 page parent/teacher guidebook, tests and quizzes... all in one complete package for grades 2-8. Astronomy 2: This volume builds on the fundamental ideas covered in Astronomy 1. Students will discover stars, planets, moon, comets, asteroids, galaxies and more. Students will discover Martian sunsets, eclipses and transits, discover how to identify meteorites, investigate the forces driving Neptune's internal furnace, learn how binary planetary systems work, diffract light into its rainbow signatures while learning about the electromagnetic spectrum and more. Includes student worksheets, 30 instructional videos, 17 lessons, 78 page student workbook, 119 page parent/teacher guidebook, tests and quizzes... all in one complete package for grades 4-6. Life Science 2: Human Anatomy: Learn the fundamental concepts in human physiology and anatomy. Students will discover how to build a working robotic hand, measure their lung capacity, filter blood, detect genetic traits, chemically fingerprint their friends, and make a frog totally disappear. Includes student worksheets, 36 instructional videos, 37 lessons, 108 page student workbook, 196 page parent/teacher guidebook, tests and quizzes... all in one complete package for grades 4-8. Energy 2: Continues the journey into the field of energy by unlocking the mysteries of alternative energy, thermodynamics, and the earth's resources. Students build a homemade weather tracker station, measure energy and power, make a fire water balloon, invent two working solar vehicles, learn how to bottle clouds, and construct a working external combustion engine from soda can parts. Includes student worksheets, instructional videos, 14 lessons, 55 page student workbook, 85 page parent/teacher guidebook, tests and quizzes... all in one complete package for grades 5-8. Light 2: Students learn about intensity, polarization, frequency, refraction, diffraction, and reflection as they build an electric eye, optical cameras, reflector telescopes, compound microscopes, spectrometers, burglar alarms, optical light benches, battery-free radios, laser microscopes, laser shows, and so much more. Includes student worksheets, 23 instructional videos, 14 lessons, 59 page student workbook, 119 page parent/teacher guidebook, tests and quizzes... all in one complete package for grades 5-8. Forces and Motion 2: A comprehensive course that continues the science adventure in physics under Newton's work on the three laws of motion. Students get a crash-course in projectile motion as they build g-force accelerometers, float hovercraft on both land and water, build a rocket car, and measure the Earth's magnetic pulse. Includes student worksheets, 21 instructional videos, 18 lessons, 79 page student workbook, 124 page parent/teacher guidebook, tests and quizzes... all in one complete package for grades 5-8. 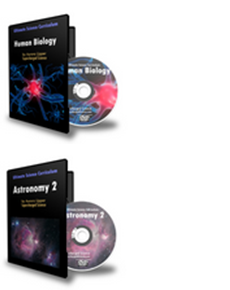 Astronomy 3: A comprehensive course that continues the astronomy adventure from Astronomy 1 & 2. Learn how to design and build reflector and refractor telescopes, investigate how gravity curves spacetime, detect black holes, build a calibrated spectrometer, play with the electromagnetic spectrum, and uncover the mysterious forces that shape the incredible universe we call home. Includes student worksheets, 27 instructional videos, 77 page student workbook, 147 page parent/teacher guide, lessons tests and quizzes... all in one complete package for grades 6-9. All volumes were assembled based on the national standards for science and also from a decade of personal experience in teaching kids science. Each set comes with student worksheets, instructional videos, lessons, workbook, parent/teacher guidebook, and tests and quizzes. 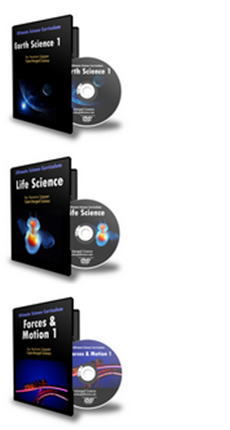 The Ultimate Science Curriculum DVDs contain the curriculum organized into a PDF document that are also located on the DVD. You may print out the worksheets for each experiment as you go along. The DVDs also contain instructional step-by-step videos that show exactly how to perform the experiments in the included workbook.